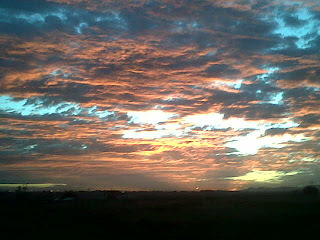 Now that it is summer in South Africa, the sun is rising as I leave the house in the morning for work. Sometimes the sunrise is bleh, meh or simply stunning. Here is a picture of one with lovely colours that looks like it was soaked with the strokes of a happy artist. Shaheen: Thanks for dropping by. Your blogs seem to be interesting! Cannot wait to read more. Thanks Mylifescape! Wish I had a better camera though. OH my! that was really amazing pic.